Domaine Berthet Rayne, located in the Courthezon appellation is a relatively new producer, as they only formed the domaine in 1978. Prior to that date, the property was known as Domaine des Cigalons. 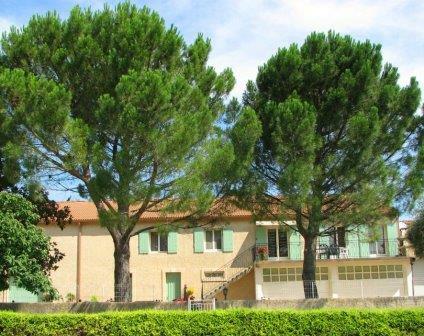 In fact, Domaine des Cigalons only dates back to 1920, when the estate was founded by Raoul Raymond. At the time of the purchase, the vineyard was devoted to cherries. In 1978 Dany Raymond, the grandchild of the founder married Christian Berthet-Rayne and as you can guess from the name, Domaine Berthet Rayne was founded. Today, the vineyard is managed by Laure Capeau and her husband Martial Capeau. Domaine Berthet Rayne owns 25 hectares of vines. Of their vineyard land, 14.7 hectares are located in the Chateauneuf du Pape appellation. The majority of their vines are situated in the Chapouin, Coudoulet and La Gardiole lieux-dits in the northern part of Chateauneuf du Pape. Much of their terroir consists of clay and chalk soils. They have old vines. Their oldest vines are more than 100 years of age. They also own vines located in the Cotes du Rhone. Since the extremely difficult 2002 vintage, Domaine Berthet Rayne has relied on 100% organic farming techniques. Domaine Berthet Rayne is Ecocert certified. Domaine Berthet Rayne produces 4 red Chateauneuf du Pape and white Chateauneuf du Pape wines. Vinification takes place in traditional cement vats. Most of the wine is aged in stainless steel. Domaine Berthet Rayne Tradition is made from a blend that is usually close to 60% Grenache, 20% Mourvedre, 10% Syrah and 10% Cinsault. The berries are vinified in cement tanks. The wine is aged in neutral vats or tank for an average of 12 months. Close to 2,000 cases are produced each year. Domaine Berthet Rayne Elixir des Papes is made from 100% old vine Grenache. The terroir is rocks, pebbles and limestone soils in the Coudoulet vineyard. The grapes are destemmed according to the needs of the vintage. Vinification takes place in cement tanks. Domaine Berthet Rayne Fut de Chene is produced from a blend of 65% Grenache, 30% Mourvedre and 5% Cinsault. The terroir is rocks, pebbles and limestone soils in the la Gardiole vineyard. The average of the vines used to produce this cuvee are 50 years of age. The grapes are destemmed. The grapes are vinified in cement tanks. The wine is aged in demi-muids and used French oak barrels for up to 18 months. 900 cases of this wine is produced in most vintages. Domaine Berthet Rayne is Cuvee Cadiac, the top wine of the estate is produced from an even split of 50% Grenache and 50% Mourvedre. On average the grapes come from vines that are over 65 years of age. The terroir is rocks, pebbles and limestone. The vines are planted in the Coudoulet lieu-dit. The berries are destemmed. Cuvee Cadiac is aged in up to 100% new, French oak barrels for an average of 12 months. Not much of this special wine is produced as production is on average close to 200 cases per year. Domaine Berthet Rayne Blanc is made from a blend of 40% Clairette, 40% Bourboulenc, 10% Grenache Blanc and 10% Roussanne. Domaine Berthet Rayne can be enjoyed on the young side. Young vintages can be popped and poured, or decanted for about 1 hour, give or take. This allows the wine to soften and open its perfume. Older vintages might need very little decanting, just enough to remove the sediment. Chateau Domaine Berthet Rayne is usually better with 3-4 years of bottle age. Of course that can vary slightly, depending on the vintage. In the best vintages the wine should be consumed within 4-15 years after the vintage. Domaine Berthet Rayne is best served at 15.5 degrees Celsius, 60 degrees Fahrenheit. The cool, almost cellar temperature gives the wine more freshness and lift. Domaine Berthet Rayne is best served with all types of classic meat dishes, veal, pork, beef, lamb, duck, game, roast chicken, roasted, braised and grilled dishes. Domaine Berthet Rayne is also good with Asian dishes, hearty fish courses like tuna, mushrooms and pasta. The white wine of Berthet is best served with a myriad of different seafood dishes, shellfish, crab, lobster, sushi, sashimi, chicken, pork and veal, as well as Asian cuisine. Medium bodied, forward, soft and supple. The spicy, fruity, charming, soft textured wine is refined, elegant and open. Fresh and polished, you can enjoy this on release. The wine is produced from a blend a Grenache dominated blend along with all the other allowable grape varieties from the appellation. Medium bodied and loaded with juicy, sweet, ripe, cherries, the wine is soft, fresh and forward making this a treat to drink on release. The wine was blended using 65% Grenache, 20% Mourvedre, 10% Cinsault and 5% Syrah. Earthy, garrigue, deep, red fruits, barnyard, dark spice and licorice set off the complex aromatics. On the palate the wine is lush, round and supple, leaving you with licorice and juicy, peppered plums in the end notes. You can definitely enjoy this beauty in its youth. The wine was made from a blend of 65% Grenache, 30% Mourvedre and 5% Counoise. Round supple textures, juicy fruits, earth, herbs and licorice combine to create complexities. Sweet and fresh, the medium bodied wine should not require much aging to show its best. Silky, soft and polished, with a core of sweet, ripe cherries, thyme and herbs. The wine is soft textured and fresh, with a kirsch filled finish. The wine was produced using 100% Grenache. Medium bodied, forward, direct, easy going kirsch filled wine with a bit of spice and a nice sweetness to the red fruits. The wine was blended from 65% Grenache, 20% Mourvedre, 10% Cinsault and 5% Syrah. Sweet, lush red fruits, soft textures and forward as well as modern in style. The wine was made from a blend of 65% Grenache, 30% Mourvedre and 5% Counoise. Garrigue, licorice and kirsch create the nose. Forward, medium bodied and ending with a sweet, fresh, red cherry finish. The wine is made from 100% Grenache. Medium bodied, fresh, sweet, ripe fruits and pepper, with an elegantly styled finish for early drinking. Produced from blending 65% Grenache, 20% Mourvedre, 10% Cinsault and 5% Syrah. With a mineral driven core of fruit, the wine is fresh, expansive and rich in texture. From 100% Grenache, the wine is supple, soft and filled with black raspberries and garrigue. The peppery kirsch found in the end note is a treat. Medium bodied, fresh filled with spicy black raspberries, the wine was produced from 65% Grenache, 30% Mourvedre and 5% Counoise. With the essence of wild strawberries, this finesse styled wine is packed with freshness and pure cherries in the finish. Full bodied, concentrated, lush and intense, this is filled with spicy, ripe, berries, with the structure for aging. Give this delicious wine a few years before pulling a cork. Fleshy, silky, elegant and filled with fresh kirsch and wild strawberries, the wine is rich and vibrant.